Texan Hank Skinner was scheduled to die yesterday for committing a gruesome triple homicide.One New Year’s Eve in 1993, Skinner’s girlfriend and her two adult sons were murdered — Twyla Jean Busby was clubbed to death with an ax handle and her boys were stabbed to death. Skinner was found hiding in a friend’s closet with the blood of at least two of the victims’ on his clothes. He was charged with their murders. Skinner has always claimed he is innocent — he said too drunk and high on prescription drugs to have committed the murders and had passed out on the couch in the home where they were killed. At his trial, he attorney, Harold Comer, opted not to test DNA evidence found on the victims’ bodies, clothes and two knives used for the murder because he feared it would make things even worse for his client. Tests performed on hair found at the scene were inconclusive. Skinner was found guilty and sentenced to death. 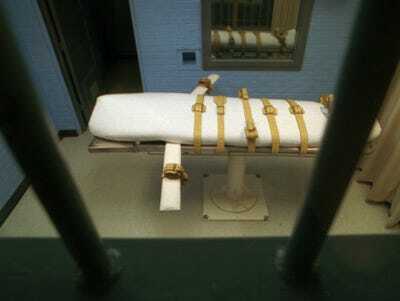 Now facing his execution, Skinner asked that the untested DNA evidence be tested, but prosecutors argued he was not entitled to the testing of evidence not analysed prior to his trial, and appeals courts have agreed. Skinner was scheduled to die yesterday, but the U.S. Supreme Court stayed the execution hours before it was to occur. His attorneys, including University of Texas at Austin law professor Rob Owen, have filed suit against the Texas district attorney whose office initially prosecuted Skinner, and they want to test the DNA as part of that case, the AP reported. The attorneys had appealed to both to the Texas governor, Rick Perry, and the Supreme Court. The Court stayed the execution only until it decides if it will hear the case. If it chooses not to hear his case, the execution will be rescheduled. Gov. Perry had not made a decision by the time the Supreme Court stepped in. The issue at the heart of this case is quite simple. There is DNA evidence available — if it is tested and proves Skinner committed the murders, his execution will go forward. If it is tested and it proves his innocence, the State of Texas will have avoided executing an innocent man. Further, if someone else committed the murders, or if Skinner is guilty and it appears he had an accomplice, it would be in the interest of the state to try to bring a case against that person. The Houston Chronicle has full coverage of the case.